The toughest of the 1818 overdates, yet there are still quite a few higher grade examples available up to MS65. The later die state is more scarce and far fewer specimens remain. Variety Attribution: Obverse-Date is a wide 11 mm. 181 wider than last 18, first 8 larger than second 8. Serifs and crossbar of 7 show above top of 8 and trace of stand in lower loop. Center dot on neck. Die crack from edge through star 11 to curls is a bit heavier. O-103a: Die crack from edge through star 11 to curls is a bit heavier. There is a fine vertical crack from milling left of date. Another from bottom of first 8 to top of second 8. 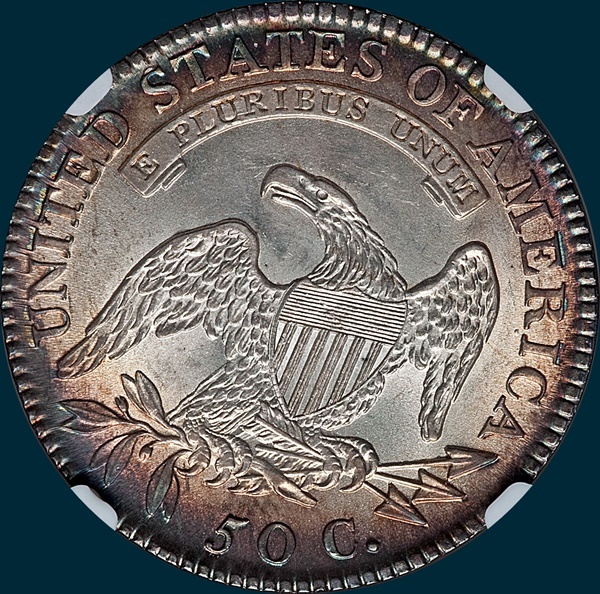 Reverse- 50 C. is 1 1/2 mm and rather low. Arrow to A is 3/4 mm. Arrowheads are close and connected by small die defects. There is a triple segment in milling below the lowest pair of leaves and a small die dot in field below RI. 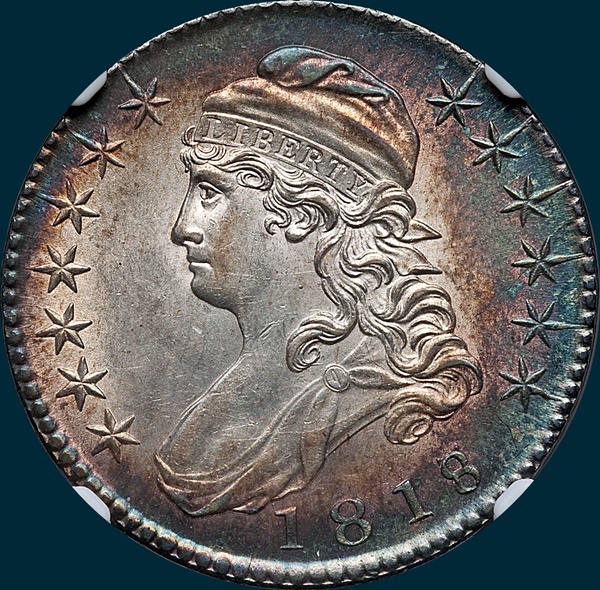 According to Edgar Souders, he estimates that the projected mintage for this overdate is approximately 392,062. Get his book Bust Half Fever and read all about overdates and how he came up with the number! This number would include three Overton varieties, O-101, O-102, and O-103.